TQSF series gravity destoner is designed on the basis of original gravity destoner for removing small stones and other impurities. It has high efficiency in separating the heavy impurities such as stone, mud from rice, paddy, wheat, soybean and other grains for grain processing plant. Besides, it can simplify the technological process and improve the milling quality. This equipment adopts advanced reverse cleaning theory, efficiently removing the impurities from the grain, which provides additional protection to downstream process. 1.Reasonable design, small volume, low energy consumption, stable operation, good stone-removing effect. 2.Grades the grains and removes the stones simultaneously. 3.Driven by two vibratory motors, no grain releasing from the stone outlet in the interval of operation. 4. Incline angle of sieve, amplitude and air volume can be adjusted. 5.Fully enclosed structure, no dust, low noise, safe and health. 6.Be applicable for seed selection too. 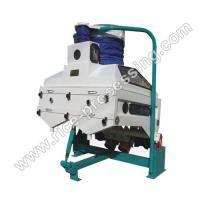 Our company is specialized exporter, manufacturer and supplier of TQSF Series Gravity Destoner in 中国.